Chirag Delhi bus station. Flickr photo by Madhav Pai. 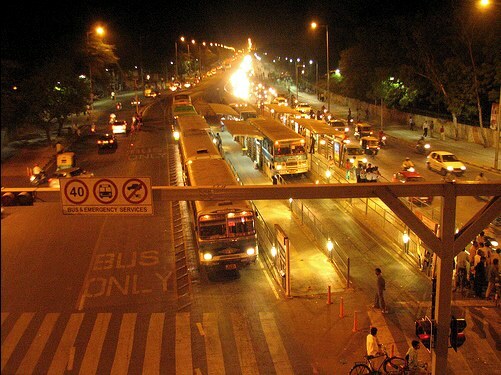 The bus rapid transit (BRT) corridor in Delhi is one of the most controversial projects in Indian urban transport. It encountered several problems during the first week of its implementation, stirring up a great media outcry. But the Delhi Government was able to recognize the positive impact of the project for pedestrians, bikers and bus commuters, and it decided not to scrap the pilot corridor. The Delhi government elections in November largely ran on a platform that included going ahead with the busway expansions, but some media outlets and transport experts urged the city to ditch the project altogether. The Times of India, for example, reported that the Standing Committee in Parliament recently said plans for BRT system would be a “nightmare” for Delhi residents and should be abandoned. But it looks like the media reports may not have been telling the whole story, says Sanjeev Lohia, director of the urban transport division for the Ministry of Urban Development. As the Senior Transport Engineer for EMBARQ, I agree with this statement. I have already indicated that the Delhi busway project goes in the right direction, but needs several improvements. Traffic problems, pedestrian accessibility and bus operation difficulties can be fixed by making some modifications to the busway and stations infrastructure, redefining the service plans, introducing controlled operations, educating all the users of the facilities (pedestrians, bikers, motor vehicle drivers, and bus commuters) and enforcing regulations. The current bus operations do not provide a comfortable alternative to private vehicle users, and current traffic intersection management results in very long queues and delays both for bus and car users. The big claim by many opponents of bus rapid transit is to give back the space for cars, as a solution of congestion. This does not work. There is no way of solving traffic jams by providing infrastructure for individual motor vehicles. The option is to have high quality mass transit, though not necessarily rail. Metro is a good option, but it comes at a very high cost, and there is no way to have Metro lines everywhere. Metro should be complemented with good quality bus service. Therefore, bus rapid transit should be an important component of the sustainable transport agenda in Indian cities.